Recipe submitted by Debbie Kimrey-Hodges, Vice President & Divisional Merchandise Manager of Cosmetics & Skin Care, Wal-Mart. 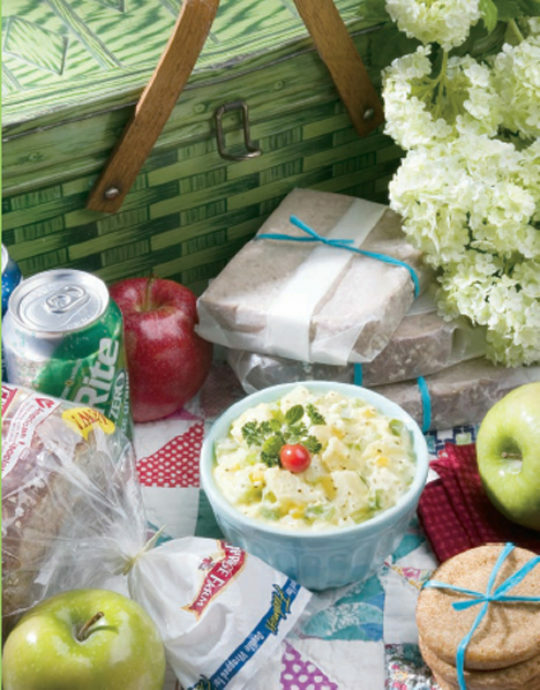 When you plan and fill your family’s picnic basket, surround Mom's Old Fashioned Potato Salad with whole-wheat bread and fresh fruit (both have fiber), and thoughtful beverages. And be sure to clean those hands before you eat! Place potatoes in large saucepan with enough water to steam. Cover and steam about 1 hour until tender. Drain and cool. Dice potatoes and season with salt and pepper. In a small bowl mash hard boiled eggs. Combine celery, red onion and red bell pepper into small bowl with mashed eggs. In a large bowl, combine Dijon mustard, sour cream, canola mayonnaise, sugar and vinegar. Mix well. Add vegetable mixture to dressing and mix well. Add potatoes to dressing and vegetables and mix well. This recipe makes 6 (1/2 cup) servings.